Turn one egg white into little pavlovas, with raspberries and pomegranate seeds. The sight of the season’s first raspberries at the market – a bit early this year, but I’m not complaining – reminded me of two things: that the holidays will be upon us before we know it, and that I haven’t yet shared my recipe for personal pavlovas. My personal cheesecakes for two were, and still are, one of the most popular recipes I’ve published, so the stars have aligned and here are their friends, the pavs. Although I have made these for years, I am still astounded that one egg white can be transformed into enough meringue – comfortably enough – for two people every single time. While you can, of course, make these with any fruit you like at any time of year you choose, the colour and timing of making them with raspberries and pomegranate seeds has become a seasonal habit with me. Northern hemisphere Christmas food doesn’t really fit well into the height of summer here in antipodean Melbourne: when it’s 40°C (104°F), a plum pudding swathed in custard – as good as that is – feels out of place. Instead, fruit and lightness rule, though I can’t resist giving more than passing a nod to the tradition of seasonal red. There’s a lot of get-aheadness about these. The meringues, puree and whipped cream can all be made ahead and stashed away until required, meaning that getting them together as a dessert is nothing more than a simple assembly job. I specify caster (superfine) sugar for the meringue out of habit; I use golden caster simply because it's the only one I keep, and it gives the meringue a slight tan and adds a touch of caramel. You can use ordinary white sugar instead, however. For sweetening the whipped cream and the raspberry puree, if required, I use icing (powdered) sugar because I find it eliminates graininess. Again, it’s not essential, so use the sugar you have. Set your oven to 175°C (350°F). Line a baking sheet with baking paper. Trace two circles into it using anything that's round and about 13cm (5 inches) across. In a scrupulously clean metal bowl – wipe it out with paper towel moistened with a little vinegar if there’s any doubt – whisk the egg white until soft peaks form. I use the balloon whisk attachment on my handheld mixer to do this. Add the caster sugar, a tablespoon at a time, beating thoroughly between each spoonful. Sprinkle over the cornflour, add the salt and vinegar and fold through. I do this simply by detaching the whisk from the mixer and swishing through the meringue by hand. Divide the mixture between the two circles on your tray, smoothing into (rough) circles with a spoon or spatula. Try to keep them flat-topped rather than domed, as this will help them to cook more evenly. Place the tray in the oven and immediately turn the temperature down to 130°C (270°F). This will make the outsides crisp while keeping the interiors soft and marshmallowy. Let them cook at this low temperature for 1 hour, then switch the oven off. Crack the door of the oven open and let the meringues cool on their tray in the oven for 30 minutes. Meanwhile, take half the raspberries and either puree in the processor or push through a sieve. If they are very seedy, which raspberries can sometimes be, a sieve is best. Taste the puree and, if it is too tart, stir in a little icing (powdered) sugar to taste. Whip the cream, icing (powdered) sugar and vanilla together until soft peaks form. Cover and refrigerate until required. 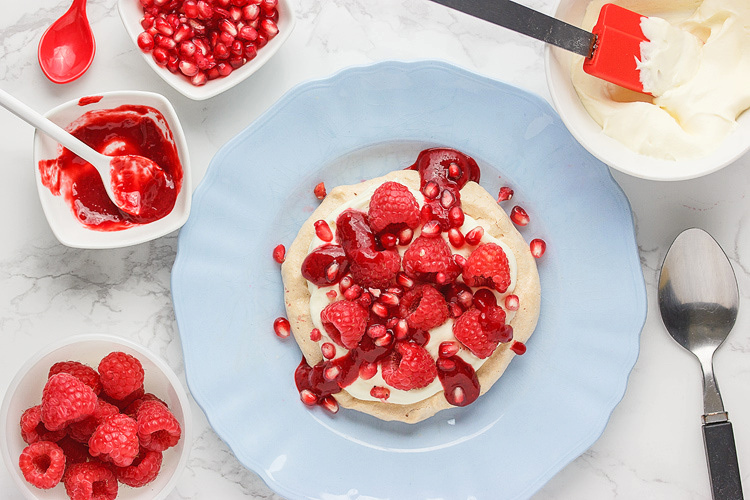 To assemble, divide the cream between the meringue bases, dot with the remaining raspberries, drizzle with the raspberry puree and sprinkle with the pomegranate seeds.